This is an excellent starter scope package for beginner astronomers that want the flexibility of higher magnifications and a larger aperture. Supplied with two Plössl eyepieces (10mm and 20mm) and 90° star diagonal, the scope is perfect for exploring the solar system and will deliver excellent views of the planets and moon. A 5x20mm finderscope makes targeting quick and simple. 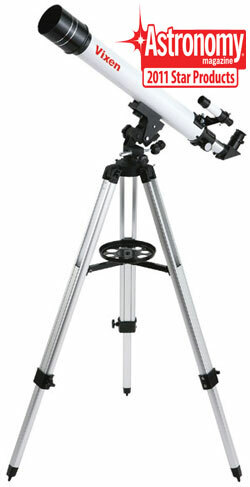 As with the smaller Space Eye 50M, the 90° star diagonal supplied with this scope allows it to be used for terrestrial observing as well as stargazing. This makes it perfect for those that want to observe ships and boats on the coast or on lakes. The easily-assembled altazimuth mount supplied includes slow motion handles to allow for smooth tracking of objects as they move across the night sky. The assembled package is also light enough to be transported, weighing just over 3kg with all accessories fitted.